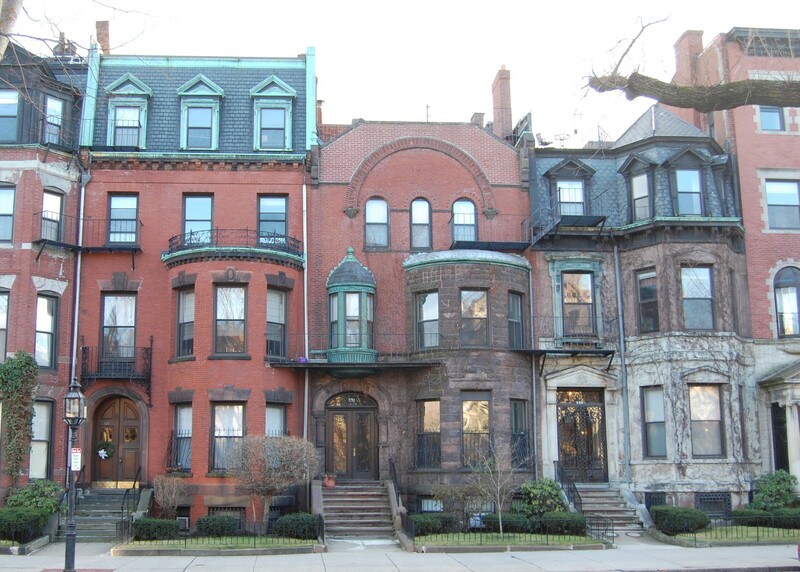 332 Commonwealth is located on the south side of Commonwealth, between Hereford and Massachusetts Avenue, with 330 Commonwealth to the east and 334 Commonwealth to the west. 332 Commonwealth was built in 1878-1879 by Henry J. Bartlett, builder, as the home of provisions dealer Benjamin Fitch and his wife, Elizabeth W. (Shute) Fitch. He is shown as the owner on the original building permit application, dated December 16, 1878. No architect is identified on the application. The house originally was numbered 330 Commonwealth until about 1889, when 328 Commonwealth was built and the houses to the west of it were renumbered. Elizabeth Fitch purchased the land for 332 Commonwealth on December 13, 1878, from lumber dealer David Nelson Skillings of Winchester. It was part of a tract of land he had originally purchased on December 16, 1870, as trustee for a trust composed of himself, Lawrence Barnes of Burlington, Vermont, Charles Whitney of Lowell, and David Whitney, Jr., of Detroit. The property subsequently had changed hands and he had re-acquired it , in his own name, on January 12, 1878. 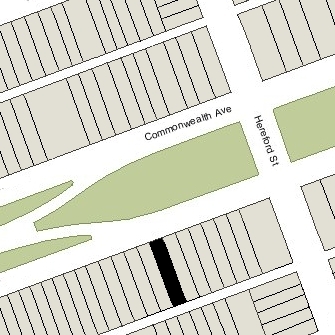 Click here for an index to the deeds for 332 Commonwealth, and click here for further information on the land on the south side of Commonwealth between Hereford and Massachusetts Avenue. By the 1879-1880 winter season, the Fitches had made 332 Commonwealth their home. They previously had lived in Somerville. They continued to live at 332 Commonwealth during the 1905-1906 winter season, but moved thereafter to Lexington. On April 29, 1905, 332 Commonwealth was purchased Elizabeth Fitch by Marcella (Ballard) Upham, the wife of Thomas Upham. They previously had lived at the Hotel Brunswick (southeast corner Clarendon and Boylston). They also maintained a home in Phillips Beach. A retired grocer, Thomas Upham was an investor in railroads and real estate. Thomas Upham died in July of 1916 at the age of 105. Marcella Upham continued to live at 332 Commonwealth. Between 1921 and 1924, she was joined there by her husband’s great-grand-nephew, Thomas Carleton Upham, a playwright. Thomas Carleton Upham’s great-grandfather, Nathan Upham, was Thomas Upham’s older brother. Between 1928 and about 1935, her niece, Miss Maud M. Morse, lived with her. She previously had lived at 134 West Newton. She was the daughter of Marcella Upham’s deceased brother-in-law and sister, Edwin and Maria (Ballard) Morse. 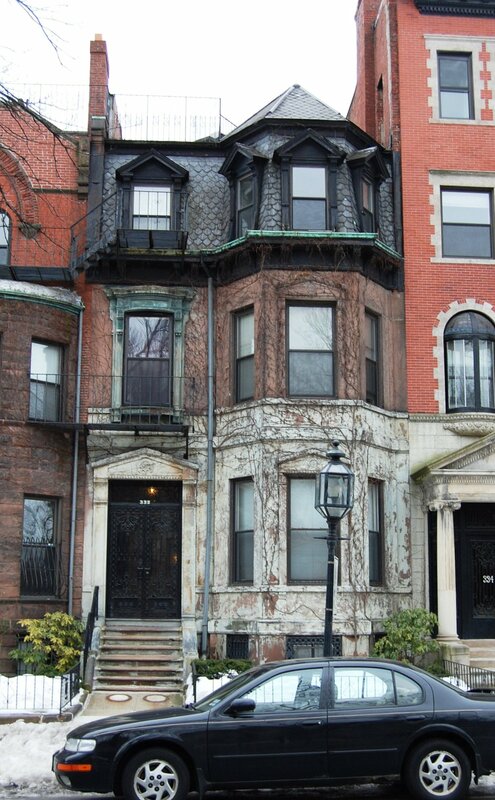 Marcella Upham continued to live at 332 Commonwealth until her death in February of 1937. She left a major bequest to Harvard and smaller bequests to several other recipients, and the bulk of her estate (including 332 Commonwealth) in trust for the benefit of her niece, Maud Morse during her lifetime, to be distributed thereafter to MIT and various charities. Maud Morse died four months later, in June of 1937. After her death, Thomas Carleton Upham challenged Marcella Upham’s will, in which he was left $10,000, alleging that he had been promised a far greater share of the estate in exchange for services he provided to her during her lifetime. The house was shown as vacant in the 1939 City Directory. On July 11, 1939, 332 Commonwealth was purchased from MIT by Dr. Julian Carrell Gant, a physician. He and his wife, Anita (Davis) Gant, made it their home. They previously had lived in Arlington. On September 21, 1939, he transferred the property into his wife’s name. In May of 1940, Anita Gant applied for (and subsequently received) permission to convert the property from a single-family dwelling into a single-family dwelling and doctor’s office. They continued to live at 332 Commonwealth, and he to maintain his medical offices there, until about 1946. By the early 1950s, he was medical director of the Madison Sanitarium Hospital in Madison, Tennessee. By 1947, 332 Commonwealth the home of Lewis William Harlem and his wife, Stacea Hermina (born Mary Erminia Stacy) (Sirois) Willett Harlem. They previously had lived in Newton. Lewis Harlem was president of the American Traveling Goods Company. In January of 1947, he applied for (and subsequently received) permission to convert the property from a single-family dwelling and doctor’s office into two apartments and a doctor’s office. The Harlems continued to live at 332 Commonwealth until about 1953. On December 23, 1953, 332 Commonwealth was purchased from the Harlems by Marion N. Doyle. On December 16, 1954, 332 Commonwealth was purchased from Marion Doyle by Louise Marie (Gautreau) Geldart Brideau, the wife of Bernard Brideau. They lived in one of the apartments. They previously had lived at 389 Marlborough. On January 8, 1959, she transferred the property to Brideau Realty, Inc. 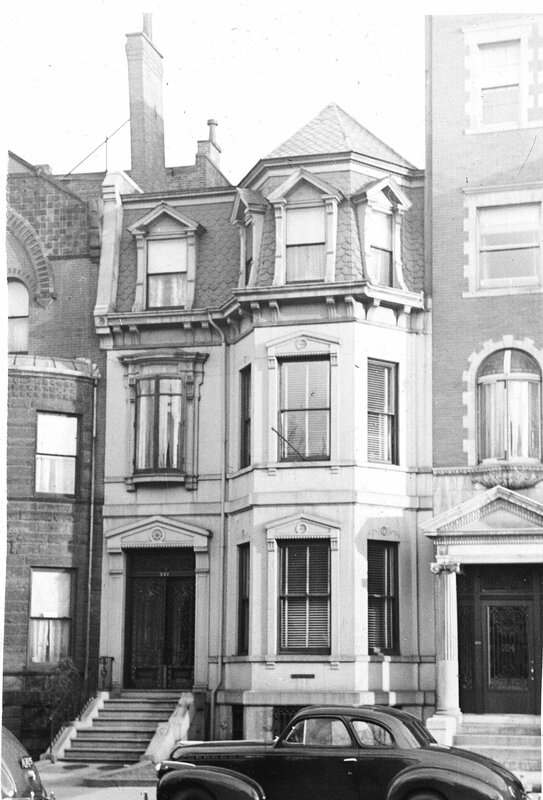 The Brideaus continued to live at 332 Commonwealth in 1963, but had moved to 250 Commonwealth by 1964. On September 9, 1963, 332 Commonwealth was acquired from Brideau Realty by Gerassimo Alexandrato and his wife, Stamatoula Alexandrato. They were lodgers at 14 Marlborough. In October of 1963, he applied for (and subsequently received) permission to convert the property from three apartments (the doctor’s office apparently having become a third apartment) into seven apartments. On June 1, 1967, 332 Commonwealth was purchased from the Alexandratos by Robert White. He already owned 324-330 Commonwealth, 334-336 Commonwealth, 344 Commonwealth, and 348 Commonwealth. By December of 1978, he owned 322–324–326–328–330–332–334–336 Commonwealth, 344-346-348–350 Commonwealth, and 354–356–358–360 Commonwealth. In December of 1988, he applied for (and subsequently received) permission to convert 332 Commonwealth from seven apartments into eight apartments. At the same time, he also applied for (and subsequently received) permission to combine it with 322-330 Commonwealth and 334 Commonwealth into one property with 63 apartments, to be known as 322-334 Commonwealth. 336 Commonwealth remained a separate property. 332 Commonwealth remained an apartment house in 2018.